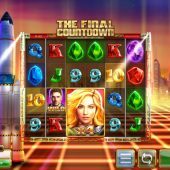 The Final Countdown slot will be known by some as Danger High Voltage II as it's Big Time Gaming's sequel to that dual-bonus 4096-way game. Whereas on Danger High Voltage we had the Electric Six providing the soundtrack of the slot's name, here we have Swedish rockers Europe and their smash 1986 hit The Final Countdown as our musical score. The reels lie over a futuristic cityscape with the BTG rocket to the left and a grid of lighting which reacts to the colour of the winning symbols you land on any spin. The base game is a little more volatile than the Megaways slots such as Bonanza and Who Wants To Be A Millionaire but you do see the bonus more frequently. All I can say is that I hope our bankroll doesn't enter a final countdown too as we take on this colourful but risky game. The six reels of four rows each give us a permanent 4096-ways on The Final Countdown slot with symbols both single and stacked bar the scatters. There is some interesting stuff about the Wilds but before that we'll check out the 6-of-a-kind pays. The Purple Crystals award 25x stake, Red 2.5x, Blue 1.5x and Green 1.25x. The rest are six card values at 1x down to 0.4x and gold scatters can appear on all six reels too. Cloned reels occur randomly in the base game as you may have seen on Netent's Twin Spin game. From 2 to 4 of the middle reels can join and stop on the same symbols including the scatter. Now the Wilds will only appear singly on those 4 reels too but if they land on conjoined reels they will become block Wilds according to the amount of reels joined. So with two reels joined the Wild will turn into a 2x2 Wild therefore paying 4x if it counts in a win. Three reels and the Wild is 3x3 paying 27x and rarely you'll see four reels join and if the Wild appears in them when they stop you are given a 4x4 block Wild which therefore will guarantee a substantial win as it becomes a 256x Wild from reel 2 to 5! 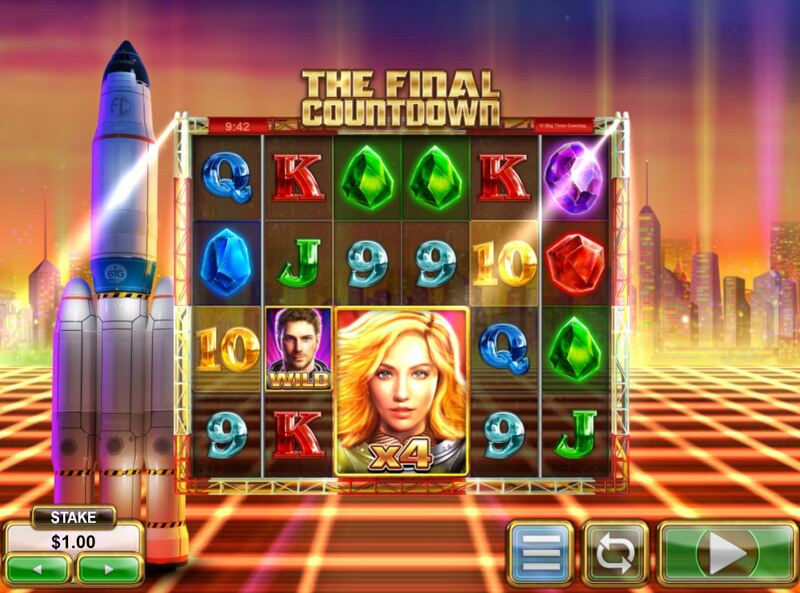 Countdown Spins - 8 free games and you will notice a clock displaying 10 on the let of the grid. You will get the Lady Pilot as a 2x2 Roaming Wild within the centre 4 reels every spin which may or may not create winning ways. Every time a scatter lands, the 10 on the clock will go down 1,2 or 3 on a random basis. If you reach zero you are given 4 extra spins and from the point you reach zero the Roaming Wild becomes a 3x3 or 27x Wild for the remaining free games. The massive potential here can be reached from getting a second retrigger in the same way - if you do, 2 more extra spins are awarded and the Wild doesn't roam any more as it will become a giant 4x4 or 256x Wild stuck on the centre 4 reels for the remaining free games. In this scenario a purple gem on reel 1 and 6 will give you a huge 22,200x bet win! Heading For Venus spins - you get 15 free games which can be retriggered. The Roaming Wild in this case is the Male Pilot and will not always appear but when it does it will be at least a 2x2 or 4x one. It randomly increases its multiplier and expands too, so you could get 27x, 65x or anything up to the absolute maximum of a staggering 888x block Wild!